Serious lacerations and deep cut injuries can be devastating. Skimping on quality or providing an item that is not fit for purpose is not OK. Compromise on safety leads to many short and long-term negative impacts for both workers and employers, regardless business size. Don’t take the risk of the OK. Use Ansell gloves with superior cut protection. Featuring INTERCEPT TECHNOLOGY™ yarns, provides high level of cut protection + excellent comfort. 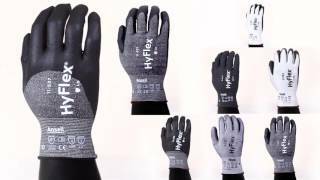 High durability PU coating allows extended glove life. Dirt masking color for longer wear times. Light weight second-skin liner supports comfort, tactility and high dexterity for precision handling of sharp, small parts. EN ISO cut level B performance. Made from 100% para-aramidyarn, is a cost effective solution for medium weight applications requiring cut & heat protection. Ambidextrous. With reinforced thumb weltincrease the glove durability. Ansell’s new INTERCEPT™ Technology provides workers with greater cut protection, whilst providing high levels of dexterity that have never been previously achieved at this level of mechanical performance. This technology is intended to upgrade hand protection and productivity in work environments where sharp tools and materials are handled. These applications can be found in automotive (press and body shop, welding), metal fabrication, white goods and the glass industry. In industries where workers handle sharp materials, the risk of a cut injury is ever present.